Having an enclosed patio built at your home in Bluffton, South Carolina, will allow you to enjoy the beauty of the outdoors all year long. Imagine having a space where you can enjoy time with family, host get togethers, or simply relax after a long day without having to worry about inclement weather, intense sun, or being pestered by no-see-ums and other pests. At Porch Outfitters, we’ve providing these outdoor living enhancements since 1987, and we’ll be happy to do the same for you. 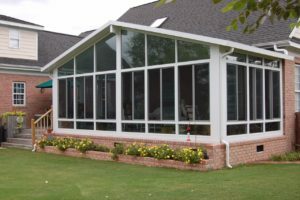 We offer a wide variety of enclosed patio systems to meet nearly any homeowner’s needs and budget. For example, if you’d like a fully enclosed space that will function as an extension of your indoor living space, we can build a glass sunroom for you. Our sunrooms come from the highly regarded manufacturer TEMO and are built to last with extruded aluminum frames with ultra-durable TEMKOR surfacing. They also have thermal wall and roofing systems to keep you comfortable all year long. And, you’ll get to select form a variety of styles, including studio, solarium, cathedral, and many others to suit your unique style. Additionally, Porch Outfitters builds screen enclosures that allow homeowners to enjoy the beautiful weather. Our screen rooms are custom built by our own team of trained and experienced professionals, ensuring your enclosure meets your needs precisely. We’re so confident in the quality of our enclosures and the skill of our installers that we provide a lifetime workmanship warranty. Contact us today to learn more about the advantages of choosing Porch Outfitters to build an enclosed patio system at your home in Bluffton, SC.